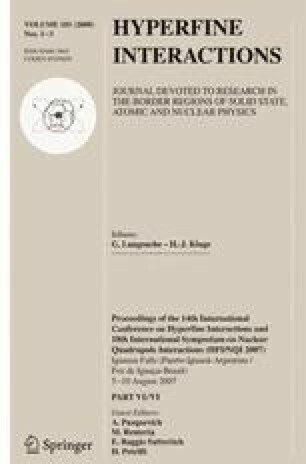 Anomalous isotope effects were detected in the 35Cl nuclear quadrupole resonance (NQR) frequency of piperidinium p-chlrobenzoate (C5H10NH· ClC6H4COOH) by deuteration of hydrogen atoms. The atoms were determined to form two kinds of N–H···O type H-bonds in the crystal structure. Large frequency shifts of the 35Cl resonance lines reaching 288 kHz at 77 K and 278 kHz at room temperature were caused upon deuteration, in spite of the fact that the Cl atoms in the molecule do not form hydrogen bonds in the crystal. Results of single crystal X-ray diffraction measurements and density-functional-theorem calculations suggest that a dihedral-angle change of 1.8° between benzene and the piperidine ring contributes to 35Cl NQR anomalous frequency shifts.